The Annual General Meeting, Annual Public meeting and normal monthly meeting of Coychurch Higher Community Council will take place on Monday, 13th May, 6:30pm at Heol Y Cyw Welfare Hall. The Annual Public Meeting, presented by the Chair, gives an update of the work of the Community Council over the past 12 months. 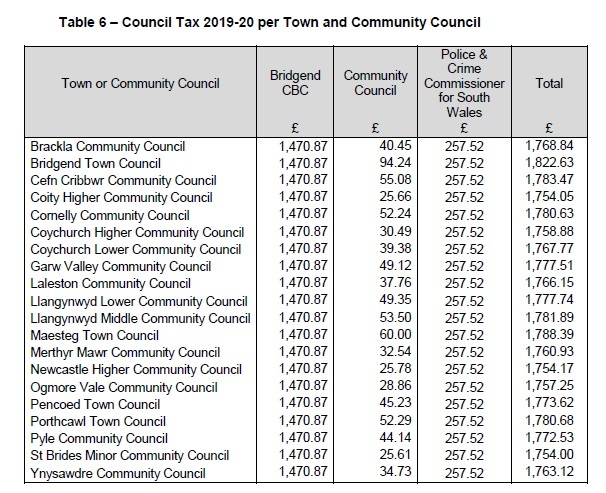 The rates of Council Tax for BCBC 2019/20 are available to see by following the link below. The Local Democracy and Boundary Commission for Wales have completed the first stage of their review and propose to split up the Penprysg Ward which includes Penprysg in Pencoed and Coychurch Higher (Heol y Cyw, Wern Tarw, Rhiwceiliog etc.). They propose to transfer Coychurch Higher from Penprysg Ward to Bryncethin Ward which will be represented by one Councillor, and the Penprysg part to be merged with Hendre (as opposed to Coychurch Higher), which will be represented by two Councillors. The proposed name will be Bryncethin Ward. A copy of the document can be seen on request to the Clerk. All observations are to be made by 15 April which gives residents the opportunity to see the document and consider their response.